Welcome to the Rabbit Hop Stop! We want you to feel comfortable and explore the world of rabbits and then a few things that are not. Are you interested in rabbits? Do you want to learn about them? Are you new or are they as familiar as the back of your hand? Hopefully you will find things here to meet all your needs. Please feel free to let me know information you would like to see included at TheRabbitHopShoppe@Gmail.com . This site is just in its beginning stages and will always be changing and growing as we expand our horizons to meet what you are looking for in this website. For now this page is the start and will include our basics and will grow into multiple pages as we begin to incorporate everything into this website, so check back often!! Here are our links and some of our favorites in reference to bunnies. See moving "showcase" below, which is also a link to the shop. Etherbun: I took these right off Google. Etherbun is a great yahoo group that really helped me get started and take care of my rabbits since the very beginning. People seem to be monitoring it even at 3:00 in the morning and I've learned so much by educated and just plain old caring people! They have strict guidelines and are not as into the warm and fuzzy posts because it would eat up a lot of space in the list serv and cause extra un-wanted e-mails. I personally recommend getting the digest form when signing up to keep your in-box from being flooded. If you have any questions about them, please e-mail me. 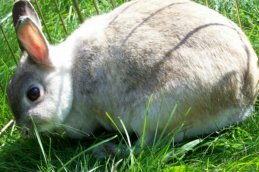 Rabbit Health Issues, Diagnosis and Treatment for the layperson. Bunnies R Us: Another good list serv which does include the warm and fuzzy stuff! This website has been great for finding out information that is extremely helpful for medical references to make more informed decisions. Of course this doesn't replace a vet, but it can make you more informed. Also if you don't have a rabbit vet in the area where you live, you might be able to print up articles to bring with you to the vet. Or you can bring this link to a vet. Barbi Brown's Bunnies is a breeder rabbitry that has helped me with its online references for treating head tilt/ e. cunniculi. It is something that you don't want with your rabbit (s). I have found her helpful when my vet wasn't. I am not knocking vet care. I have found a better vet since then, but also have learned some things which may seem unorthodox to some vets. This does not replace vets, but some stuff can be avoided. Some breeders are great at what they do and some are cheap, unethical and uncaring about the rabbits they produce. I don't go out of my way to look for breeders, but have found ethical ones. Some may disagree with me, but Barbi Brown helped me when my vet couldn't in saving and helping more than one rabbit's life.